"SARAH'S KEY", which concerns itself with a modern American journalist's search for closure once she discovers the a personal connection to the murder of a Parisian jewish child's disappearance during the Holocaust, could easily be called a "weepy". In fact I nearly avoided it for that reason. Weepies, if done well, do in fact bring about the desired effect in me. The problem is, they're usually overblown and rely on soaring music to do their dirty work for them, which instead makes me scoff and retch and laugh at them instead. Not "Sarah's Key". This is the real deal. 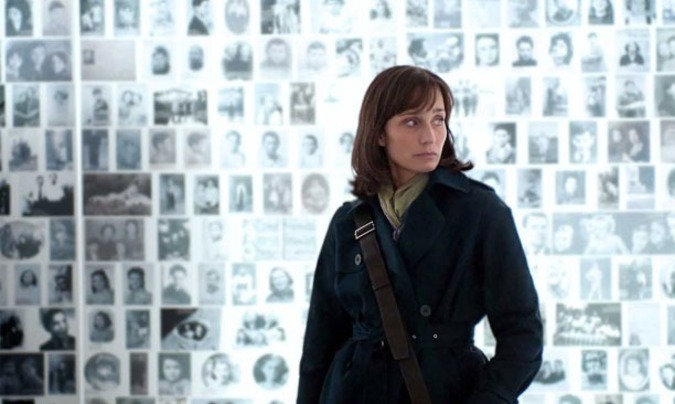 Kristin Scott Thomas plays the journalist (Julia) in question, and her early forays into reporting on a nearly-forgetten round up of the Jews of Paris into deportation purgatory leads her deeper and deeper into one particular story - that of two children who were caught up in the German-ordered, French-led sweeps. The Paris apartment that she and her husband are about to move into happens to be one in which a little girl (Sarah) locked her brother away in during the frantic sweep of the neighborhood during 1942. In stashing him away, it was to prevent him from being found by the evil Vicky puppet-police. Of course, she and her parents were never allowed to come back to the apartment. Julia beings to piece together this story, out of guilt and out of desire to uncover the truths about an awful period in French and human history. Meanwhile, her marriage is unraveling, but one thing I liked about this film is that this is put way in the background of the main story. Lesser filmmakers would have probably found some sort of moral or dramatic equivalence between a dissolving marriage and the murder of six million Jews. I only partially jest. Anyhow, it's a thrilling film in its way, nearly a mystery, told in both flashback to 1942 and immediately after the war, as well as in the present. When Julia finally discovers what happened to Sarah, whom we've come to adore by this point for numerous reasons, it's pretty crushing - and then it becomes even more so. I was fairly surprised by how powerful and strong this film was, because it really came & went last year with barely a huzzah. I think it's, if not award-worthy, then very close to being so. Defintely worth a couple of hours and a couple of kleenex boxes of your time & investment.